Thornhill strained to find that secret river. In every direction, the reaches of Broken Bayseemed to end in yet another wall of rock and forest. A man could sail for days and never find his way into the Hawkesbury. It is on his first trip up the river, helping an older lighterman, Thomas Blackwood, that Thornhill spies a plot of land which he calls Thornhill’s Point, and a yearning for it is kindled, a longing to own a piece of land that would be beyond him in London. All he had to do was pitch up and take it – oh, and convince his Missus that it was a good idea. There were a lot of stories inSydneyabout troubles with the aboriginals on the Hawkesbury so she is quite nervous about moving there. So too is Thornhill. Grenville’s writing is evocative; her sense of place is exacting. Thornhill grows up in grinding, stomach-aching poverty inLondon, where the [p9] “light struggled in through small panes of cracked glass and the soot from the smoking fireplace veiled the walls.” Have a look at those word choices(! ): struggled, small, cracked, soot, veiled: his life reeks of cold, hunger, and want. This theme of having a home, something of his own, feeds his desire to set up on the secret river. There, Thornhill and Sal – as well as their burgeoning brood of children – come into the realm of a hardy bunch of white-settler neighbours, although the closest is an hour away. Some of these are intent on eradication of the natives, people like Smasher Sullivan and Sagitty Birtles. Others, like Blackwood, are more than sympathetic to the natives. Blackwood has had a daughter to an aboriginal woman. Tensions are already high between these various factions, and whenever they get together talk quickly turns to the question of the latest ‘depredations’ of the natives. One of the great plot elements here is Sal’s great reluctance to leaveSydneyand take up land on the Hawkesbury. They come to an agreement: she would give him five years and then they would return toLondon. The deal sets up great tension. We know he wants to stay and she wants to leave. What will give? Thornhill plants corn on his land, in part to say to all-comers, ‘this is my land.’ In the process he rips out the yam daisies that are a staple for the local aboriginals. This theft of food supply is an oft-repeated early flashpoint in colonial settlements around Australia, and is thus very realistic. Elsewhere, historical accuracy has been questioned. Much has been made of the climax of the book as well as how believable it is for Smasher to get away with his constant acts of depravity against the natives. Aboriginal Law works on a ‘payback’ system. Whilst aboriginals had a collective system of guilt in which the perpetrator’s family members could be substituted for ritual payback, aboriginals picked out the guilty where they could. Watkin Tench, a first fleet lieutenant, told the death of the governor’s game keeper, who it seems, was speared for payback for his presumed killings of aboriginals. It stretches credulity, say critics, that Smasher was not subject to payback by the local aboriginals, particularly as he lives by himself. Such are the dangers of historical fiction! It seems that, for some, it is not good enough writing a gripping ‘story’, a work of historical fiction must be believable in every sense of the history of the time. I’m in two minds about this. Stories should ‘ring true’ but at the end of the day they are fiction. Grenville was at pains to point out that The Secret River was a work of fiction and not history. Smasher is an evil man but a good fictional character, just as Blackwood is a good character. They each serve their purpose in building the conflict that drives the story. What Grenville does brilliantly is make us sympathise with a character who will end up doing something unspeakable. Some point to the unusual novelistic end where Thornhill goes unpunished for his deeds. Yet Thornhill is punished: one of his sons, Dan, who grew up on the river and swam with black children and learned some of their ways, like how to make fire, deserts Thornhill and goes to live with the broken Blackwood. This estrangement pains Thornhill. But what pains him even more is his searching of the ridge-tops at the end with his looking glass, trying to spot an aboriginal still living in the wilds. One gets the feeling that had he his time again he would have made another choice. It’s not the punishment society should meter out to him, but it is a never-ending suffering all the same. They were loving to each other still. She smiled at him with that sweet mouth. He took her hand to feel its narrowness in his own and she did not resist. Whatever the shadow was that lived with them, it did not belong to just him, but to her as well: it was a space they both inhabited. But it seemed there was no way to speak into that silent space. Their lives had slowly grown around it, the way the roots of a river-fig grew around a rock. Through the doorway of the hut he could feel the night, huge and damp, flowing in and bringing with it the sounds of its own life: tickings and creakings, small private rustlings, and beyond that the soughing of the forest, mile after mile. … I decided that my job as a novelist wasn’t to reconstruct the authentic … eighteenth-century vernacular. My job was to produce something that sounded authentic. It is interesting that Grenville refers to her protagonist throughout the book as ‘Thornhill’ rather than ‘William’, something she repeated for her character Rooke in her wonderful follow-up novel The Lieutenant (see my review). I wonder why this is? Is it because she didn’t want us to get too close to Thornhill, or is it simply a choice based on the way people were known in 1800? If you have any insight, let me know. The Secret River has elements of similarity with That Deadman Dance – the dwindling sources of food, the blundering settlers, the clash of cultures, the demise of the natives – but Scott’s novel is elegiac and offers a sense of possibility and hope. The Secret River is a very different animal. Both are excellent. Let’s hope that we can build not as William Thornhill does – covering the fish carved by the aboriginals in the rock with his stone-walled home – but as Bobby Wabalanginy would have us do, with a sense of togetherness. The Secret River won the Commonwealth Writers’ Prize and the NSW Premier’s Literary Award, and was shortlisted for the 2006 Man Booker Prize (won by Kiran Desai’s The Inheritance of Loss (see my review here); for mine, The Secret River is the better book). There’s an interesting discussion of the book on the Guardian’s Book Club website, including an interview with Kate Grenville: see here. 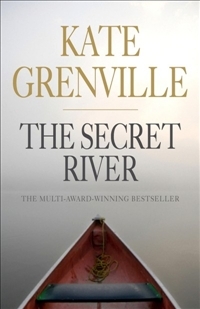 There’s also a lively discussion on The Secret River on the ABC First Tuesday Book Club’s website. Ah, Dilettante, seems we think rather alike. I didn’t think this book was so historically inaccurate that it was unbelievable but have had many discussions on this with various people. She said she was writing it from the point of view of how a white person might have reacted and behaved, and to me that rang true. I think she’s a great writer … glad you agree. Oh, and I liked Searching for The secret river too. What a fascinating read that was.